Natalie wins the Black Box HOH competition to search through muck and feathers for discs, narrowly defeating Corey. Since Natalie and James have been playing both sides all summer, this week they'll have to show their cards. Their cards apparently are to keep the other god awful showmance, Nicole and Corey, safe, pointing out that Paul and Victor are both big threats at winning the whole game (and Paul has stated James should be targeted). A wrench is thrown into plans though when Big Meech wins America's Care Package, which dubs her co-HOH. 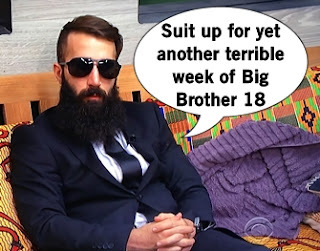 Big Meech doesn't like Nicole and would like to target her, but also understands that booting Nicole is a short-term move whereas targeting Paul, who lied to her and could win, possibly smarter. Natalie nominates Victor for eviction and Michelle nominates Paul. So not friendship. Paul is pissed that he was called a liar and demands evidence, before cooling down and telling Natalie that she was totally played by Nicorey and Paulie, then re-heating up to fight with Nicole. Paul is able to wiggle his way back into good graces to shift the target on backdooring Corey, but it only takes about a day before they realize maybe Paul should still be the target. 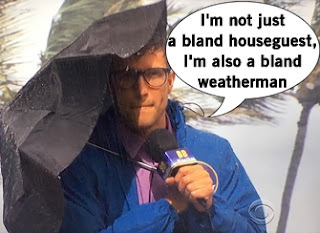 Too bad Paul is the only one who actually tries this season, staying up all night and to study extra hard to the non-stop Big Brother Storm Alerts. He wins the Power of Veto to read a teleprompter in the storm to correctly fill in the blanks, allowing himself to remove himself from the block. Corey is named the replacement nominee and I'm not sure if he's even smart enough to know that maybe he should have studied for the comp instead of having a cuddlefest with Nicole. There's only 3 votes this week which means James is the swing vote and since James has the tendency to ruin everything, we can only expect this week to end terribly. Victor and Paul try to make it look like they've had a falling out to make sure the votes go their way. The votes do not go their way and Victor is evicted a second time. But good news for him: there's a jury Battle Back happening and he might have the chance to enter the game again for a third chance of being evicted! 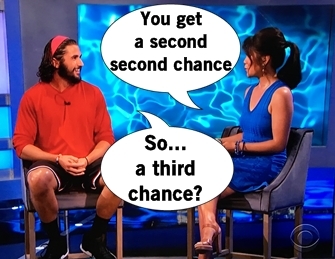 It'll be good to give the four other jurors something to do besides make Paulie miserable. Actually, stop that. Keep Paulie miserable, it's so amusing.